Can I Carry Out a Refrigerated Air Conditioning Service Myself? Most people refer to refrigerant as Freon, but that name is actually a registered trademark that is used as a colloquialism for refrigerant. This material is a blend of chemicals that move through the air conditioning system removing heat from the spaces in your home. The refrigerant has to kept at the correct pressure and temperature inside your home in order to absorb the heat and evaporate as a gas. Outside the home, the refrigerant releases the heat into the surrounding air, and it condenses into a liquid. 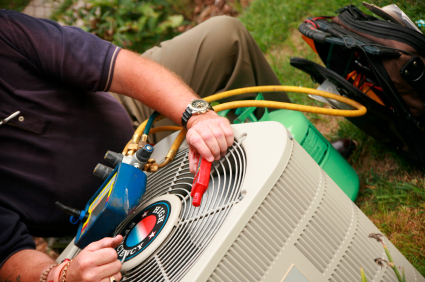 Your AC system is designed to be a sealed system where the refrigerant is never released. If the heat removal process is to work correctly, the refrigerant must remain under pressure. The chemical composition of the refrigerant is designed so that it does not dissipate over time. So it follows that a drop in the level of refrigerant is indicative of some other kind of problem. Regular refrigeration and air conditioning services will identify this problem quickly but is important to understand that the levels of refrigerant will not drop in normal operation. When the level of refrigerant drops in your system, the usual culprit is some kind of leak. Another less likely cause on a brand new system could be that there was an improper charge of refrigerant during installation. However, any problems with a brand new system would be noticed quickly so if you have had your AC system for a while it is probably a leak. The leak will have to be sealed; topping the system up with refrigerant will not correct the core problem. Insufficient refrigerant will lower the efficiency, raise energy bills, shorten the lifespan of the system and cause other part failures. Locating and fixing the leak and then recharging the system with refrigerant is a job for a professional. If they would like to arrange a refrigerated air conditioning service, Perth residents should contact us. Here at Air Cair, we have a wealth of experience in dealing with all kinds of air conditioning systems. Get in touch with us today, and we will be happy to discuss your needs in greater detail.